WASHINGTON — Sen. John McCain of Arizona is proposing a new "strategy for success" in Afghanistan. He's calling for increasing the number of U.S. counterterrorism forces and giving them a freer hand to target the Taliban, Islamic State and other terrorist groups. 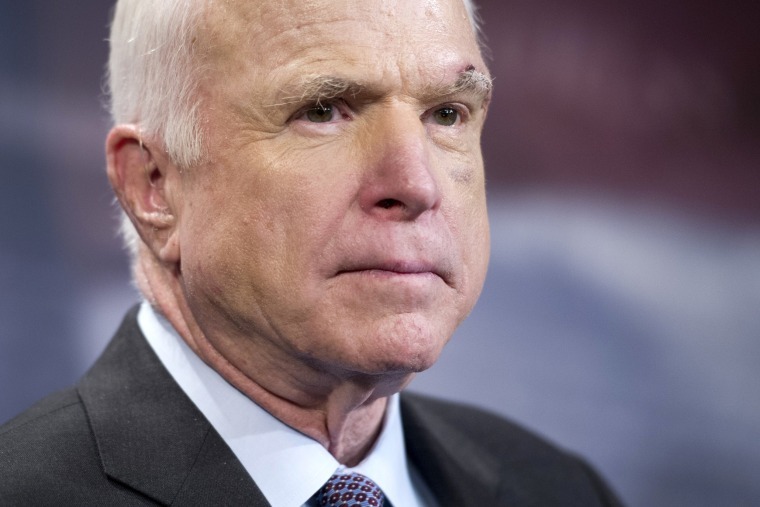 McCain chairs the Senate Armed Services Committee. He declared Thursday that "America is adrift in Afghanistan." The Republican senator has been openly critical of the Trump administration for failing to produce a plan for winning in Afghanistan. President Donald Trump has resisted the Pentagon's recommendation to boost U.S. troop levels. McCain says he'll seek a vote when the Senate returns in September and takes up the annual defense policy bill. His amendment to the bill calls for a "long-term, open-ended" U.S.-Afghanistan partnership that includes an "enduring U.S. counterterrorism presence."